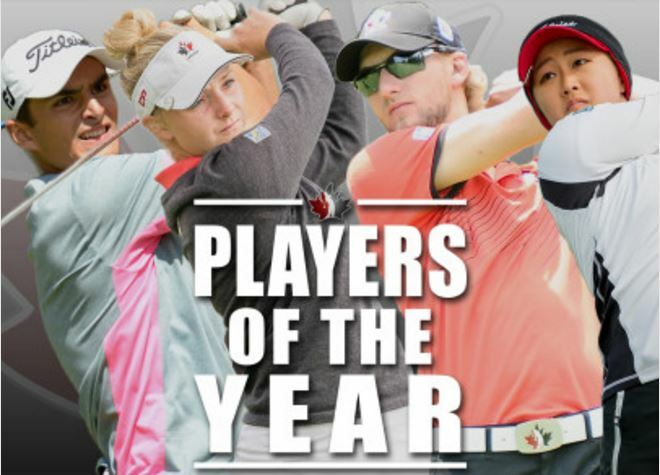 Blair Hamilton of Burlington, Ont., and dual citizen Maddie Szeryk who hails from London, Ont., as well as Allen, Texas, have been recognized as Canada’s top male and female amateur golfers after finishing atop their respective National Orders of Merit for the 2015 season. Charles-Éric Bélanger and Michelle Kim claimed top honours on their respective CN Future Links Junior Orders of Merit. Hamilton, who in 2016 will spend a second consecutive season as a member of Team Canada’s National Amateur Squad, finished with 3,768.46 points in 12 events – almost 1,000 points clear of second place. At No. 112 in the World Amateur Golf Rankings, the 22-year-old is one of Canada’s top-ranked talents. The University of Houston Cougar’s 2015 campaign netted him a PING All-America Honourable Mention and selections to the PING All-Central Region Team and the All-American Athletic Conference (AAC) Team. He claimed individual titles at the NCAA’s 2015 Border Olympics and the 2015 NCAA Lubbock Regional before adding Top-20 finishes at the 2015 Investors Group Ontario Men’s Amateur Championship and the 111th Canadian Men’s Amateur Championship to his season. Hamilton and fellow 2015 National Amateur Squad member Austin Connelly were co-recipients of the Gary Cowan Award after tying for low amateur honours at the 2015 RBC Canadian Open. Kimberley, B.C., native and 2016 National Team member Jared du Toit completed the season in second place on the National Men’s Order of Merit ahead of 2015 Team Canada Development Squad member Tyler Saunders of Sturgeon County, Alta. Fellow Albertan Brett Hogan of Calgary was fourth, while 2016 National Team selection Stuart Macdonald of Vancouver completed the Top-5. Szeryk – who will return in 2016 as a member of Team Canada’s National Amateur Squad – collected 5,505.42 points over 12 events to top the National Women’s Order of Merit. The 19-year-old is No. 43 in the World Amateur Golf Rankings and is No. 1 in Canada. In her first year with the Texas A&M Aggies, she notched seven Top-5 and nine Top-10 finishes in 12 tournaments en route to a First Team All-Southeastern Conference (SEC) selection and Conference Freshman of the Year honours. She finished first in the NCAA with five eagles and second in the nation with 127 birdies. Her 7-under 209 showing at the SEC Championship secured her second place and led the Aggies to the conference team title. Szeryk was a quarter-finalist at the 2015 British Ladies Open Amateur and the 2015 Investors Group Ontario Women’s Amateur champion. 2015 National Team member Elizabeth Tong of Thornhill, Ont., finished runner-up on the National Women’s Order of Merit, while the 2016 National Amateur Squad’s Josée Doyon from St-Georges-de-Beauce, Que., claimed third. Naomi Ko of Victoria, B.C., joined her 2016 National Squad teammates by finishing in fourth, while Anica Yoo of Port Coquitlam, B.C., was fifth. Recently-named Team Canada Development Squad member Charles-Éric Bélanger completed the 2015 campaign atop the 18-and-under CN Future Links National Junior Boys Order of Merit with 4,855.63 points in 12 events. The 16-year-old from Québec began the season by winning the 2015 Quebec Junior Spring Open before registering a third-place finish at the 2015 CN Future Links Ontario Championship and a runner-up result at the Quebec edition of the championship series for juniors. The highlight of Belanger’s year would come at the 2015 Canadian Junior Boys Championship where he prevailed in a playoff to become the first Quebec native since 1976 to claim the national junior title. Fellow Quebec native and 2015 Development Squad member Étienne Papineau of St-Jean-sur-Richelieu was second on the CN Future Links National Junior Boys Order of Merit, followed by 2016 members Alexander Smith of Calgary and A.J. Ewart of Coquitlam, B.C. Maxwell Sear of Unionville, Ont., took fifth place. A banner year propelled Michelle Kim of Surrey, B.C., to the top of the CN Future Links National Junior Girls Order of Merit with a total of 4,685 points accumulated across 10 events. Now in her freshman year at the University of Idaho, she opened last season by claiming the 2015 CJGA Western Canadian Junior Championship. Kim excelled at the provincial level, capturing the B.C. Women’s Amateur and B.C. Junior Girls titles before translating those victories into success on the national stage by winning the 2015 Canadian Junior Girls Championship. The 2015 Development Squad member’s achievements garnered her a spot on the 2016 National Amateur team. Orleans, Ont., native Grace St-Germain – who is returning in 2016 for a second stint with Team Canada’s Development Squad – was second on the 2015 CN Future Links National Junior Girls Order of Merit. Naomi Ko, a product of Victoria, B.C., finished third before graduating alongside Kim to the 2016 National Team. Céleste Dao of Notre-Dame-de-L’Île-Perrot, Que., and Monet Chun from Richmond Hill, Ont., completed the Top-5. The National Men’s and Women’s Orders of Merit recognize and celebrate the season-long achievements of Canada’s amateur golfing talents. The CN Future Links Junior Boys and Junior Girls Orders of Merit were established to acknowledge and identify Canada’s top junior golfers. Full final standings are available here.